This evening I recorded a 20 minute screencast, explaining several pros and cons to consider when selling your own eBook(s) on your own website. It is possible to sell eBooks on your own website and ALSO offer your eBook for sale through other online distribution channels, like Amazon.com or the Apple iBookstore, as long as you conform to their uniform pricing requirements. If you want to sell directly on Amazon’s Kindle Store, you can use Amazon’s Kindle Direct Publishing (KDP) site. More resources about eBook self-publishing are available on my wiki page, “Creating MultiMedia eBooks.” The other tutorial screencasts referenced in this video are linked on my “Help with eBooks” page. The e-commerce website I’ve used for the past 1.5 years to sell my eBooks on my own sites, and enthusiastically recommend, is E-Junkie. You keep a larger percentage of your gross sale price. You can receive payments in a few days instead of 2+ months. You can obtain and keep contact information for purchasers. You can readily offer discount and/or free download codes to special groups or buyers qualifying for bulk pricing. You can sell people DRM-free versions of your eBook. You will need to provide thorough instructions for customers about how to transfer eBooks to their eReader device. You will need to respond to customer questions when they encounter ebook download or transfer problems. You will need to configure your website(s) to include shopping cart links. Some locations (like schools) may block your e-commerce website. You will be responsible for your own marketing as a self-publisher. Check out the screencast, in which I elaborate in greater detail on all ten of these reasons. One thing I neglected to mention in the screencast is that I use Amazon S3 Cloud Storage to provide download bandwidth for the iPad version of my eBook, which is about 175 MB in size. See the section on “Remotely Hosted Downloads” on e-Junkie’s Help page on File Downloads for more about this. The option to use secure/authenticated downloads from your own website or file host (like Amazon S3) currently requires a premium e-Junkie account of $18 or more per month. 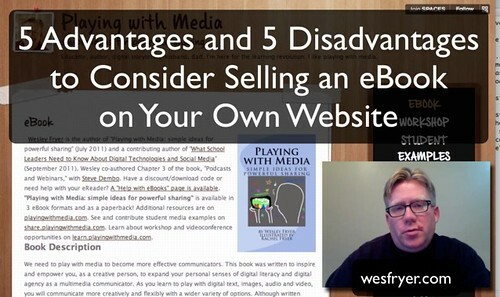 As I state in the screencast, selling an eBook on your own website isn’t for everyone. The advantages of taking this approach are significant, however, so I encourage you to consider them. Hat tip to Liz Castro for modeling the self-publishing eBooks and the option to sell them on your own site. Hat tip to Jason Neiffer who first alerted me (albeit indirectly) to e-Junkie via his debate website, Big Sky Debate. Are you selling an eBook on your own website? If so, what have you used and what would you recommend to others considering that digital sales option?